Since in 2016, the Educational Policies Program of the Auschwitz Institute has been working to develop two projects on education and prevention in El Salvador and Brazil, two member countries of the Latin American Network for Genocide and Mass Atrocity Prevention. 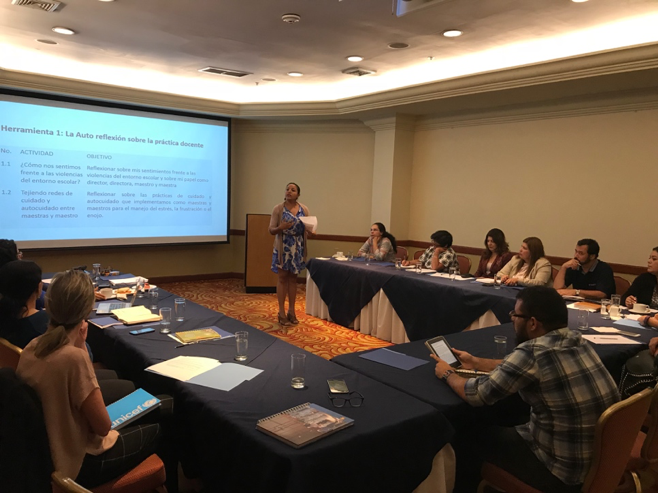 Built around an innovative and participative methodology, the project in El Salvador is focused on the creation of a toolkit for teachers and administrators working at centers of education. The completed toolkit will look to contribute to strengthening schools’ efforts to promote democratic citizenship and a culture of peace in El Salvador. The toolkit has been developed by Candy Chévez, an expert psychologist in youth participation and peace culture, and by Georgina Hernández, an anthropologist with more than 15 years of experience in the coordination of education and cultural projects on identity and memory. Continuing with the work developed over the course of the beginning of the year, on May 7, 2018, the Auschwitz Institute joined with the Office of the Ombudsman (PDDH) and the Ministry of Education (MINED) of El Salvador to organize the fourth meeting of the Working Group that has accompanied and guided the development of the project from its initial formulation. The meeting was convened with the objective of validating the completed version of the toolkit created by the consultants. Following the incorporation of inputs collected at this meeting, the toolkit is currently undergoing a process of revision and final drafting and is expected to be completed by the end of August. Beginning in September, once the toolkit has been finalized, AIPR, PDDH, and MINED will focus their attention on the organization of a series of training, diffusion, and impact-evaluation activities together with teachers, administrators, and other groups that work within the educational sphere. This is being done to raise awareness of the toolkit and facilitate its insertion and use in Salvadoran schools. Since March of this year, the Education, Human Rights, and Prevention project in Brazil has been in the implementation phase. The project is being rolled out in 7 schools of the country’s public network for media education, 5 of which are located in the city of São Paulo and 2 of which are in Brasilia. In total, 24 teachers and more than 1,200 students aged 14-18 have been successfully involved in the project. To better identify the progress and challenges emerging during the pilot phase, the project is being closely monitored by the AIPR team through direct communications with the teachers who are working with the methodology, as well as through visits to the participating schools and meetings with teachers and pedagogical coordinators. Additionally, the Regional Office of Teaching – South 1 (ROT-S1) is collaborating closely with AIPR on the accompanying efforts in constituent schools. In April of 2018, a student questionnaire was developed with the objective of identifying the level of existing knowledge on the project’s themes. Where possible, the gathered data has been normalized and a series of preliminary reports that systematize the responses of the 234 collected questionnaires has been created. At the end of the year, these reports will be utilized to measure the impact of the project on both students and on schools. It is worth noting, however, that some of the responses already highlight, in a preliminary fashion, the potential and importance of the project. For example, in their responses, many of the students expressed interest in having classroom discussions on racism, tolerance, and prejudice, and/or human rights. 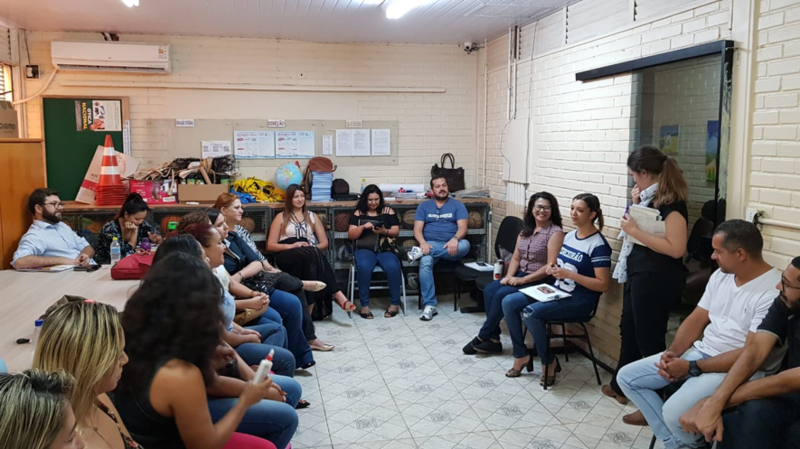 During the first week of August, the AIPR team, together with the project’s partners in Brasilia, the National Secretariat of Citizenship of the Ministry of Human Rights and the Federal Prosecutor on the Rights of the Citizen of the national Public Ministry, organized a training on the project that including the use of open pedagogical practices. The event was held with the intention of training teachers who did not have the opportunity to participate in the previous AIPR seminar held in São Paulo in March and was led by Dr. Clara Ramírez Barat, the Auschwitz Institute’s Director of Educational Policies, and by Janaina Gallo, the consultant contracted by AIPR for the project. Ms. Gallo has been a vital contributor to the advancement of this work, most notably due to her experience with relevant educational themes, having previously served as the coordinator of human rights education at the Municipal Secretariat for Human Rights and Citizenship of São Paulo and having received training in educommunication. Together with project partners at ROT-S1, AIPR will organize a workshop on video editing in September with the objective of training teachers so that they can aid students in the final step of the project. This step will consist of the team-based production of a video clip relating to the themes and challenges covered by the project and allows students to cover topics that both interest them and that would like to know more about. Following this, the completed videos will be published on an online platform that will become a showcase of sorts, highlighting what young Brazilians are thinking about. Similarly, before the end of the year, the Educational Policy Program staff is also planning to develop a video which documents the development of the overall project.